LG OLED TVs are arguably the best TVs on the market and the TVs in the company's 2017 lineup are even better. The new sets are thinner than ever, with better HDR performance for darker blacks and brighter colors. 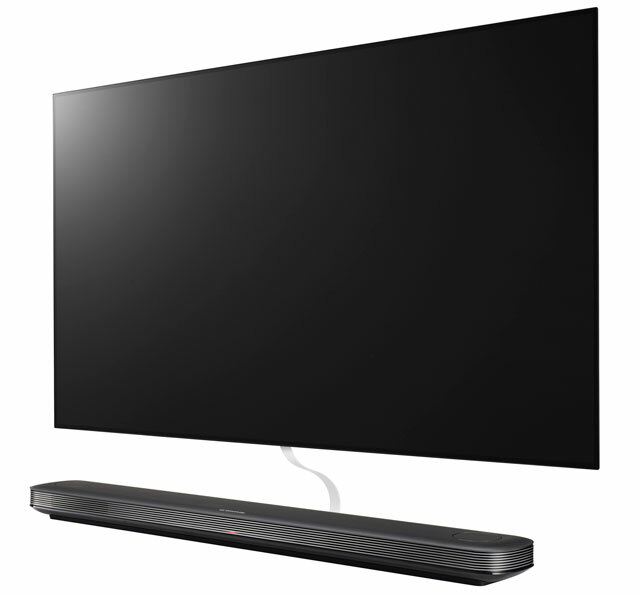 The standout model is LG's new W-Series. Available in 77" and 65", these sets are as thin as 2.57mm (for the 65"), with a "picture on wall" design that mounts flush to the wall. Even when wall-mounted the sets are less than 4mm from your wall. As a result, the sets look like windows that deliver a view into whatever show or movie you’re watching. LG's whole 2017 lineup can produce perfect blacks for high contrast images, and Ultra Luminance technology delivers more vibrant colors with an expanded color gamut. The W7 series can produce over a billion different colors and uses Active HDR—which adjusts video frame by frame—for a more vibrant picture, even when you're playing content that doesn't incorporate the latest HDR technology. Of course, that's the snag with a lot of new televisions: the content you view isn't always as good as what the TV can display, which means you don't get all of the benefits of a better screen. So you’ll want a TV that can upscale the content to take advantage of the display. The W7's Active HDR helps with that, but LG is also working to make more content available in 4K and HDR. LG has teamed up with Amazon Prime Video, Netflix, Vudu and DIRECTV, which you'll be able to access directly from the television without an additional streaming gadget. The W7 series is also the first television to integrate Dolby Atmos sound, which is the same sound technology you'll find in many theaters. It’s a 5.1.4 system, which means you have the usual three front channels, two back channels and subwoofer, plus you get 4 upward firing speakers for a truly immersive experience. Of course, these channels are virtual, since they’re coming from the TV. LG's full 2017 lineup of OLED TVs includes sets ranging from 55" to 75", all of which will be available later this year. If you'd like a preview, you'll be able to check out the W7 sets in person at select Best Buy stores (in San Francisco, Los Angeles, Las Vegas, Houston, Dallas, Boca Raton, FL, and Paramus, NJ) starting today. Do you have a program for the LG 4K tv’s ie. OLED 4K and OLED UHD 4K? If so, I would like to apply. Thank you!